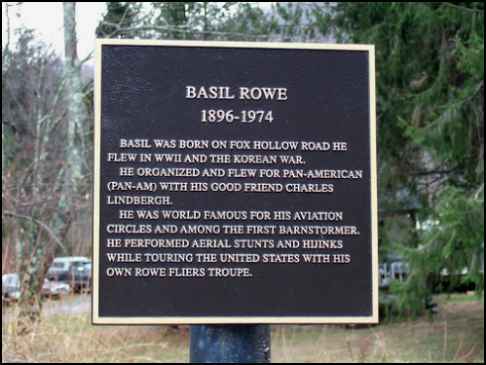 via email from Andy Ross, 8-15-03 My cousin, Basil Rowe learned to fly in 1911. He jointly owned the Chamberlin Rowe Aircraft Corporation with Clarence Chamberlin after WWI, to sell surplus planes. 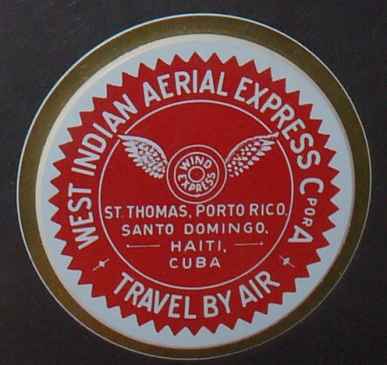 He went on to found the West Indian Aerial Express in Haiti in 1927 (absorbed by PAA in 1928). I happened to chance upon your page about Basil Rowe and thought that I would communicate with you. Basil was my uncle-by-marriage, he was married to my fathers sister in Miami. Her name was Mae and my dad's name was James P. Rozar. My family and I knew Basil well. My brother and I were born in Miami and frequently visited Basil in Coral Gables at his home. I can still remember the stories he told us of Pan Am and his flights. He also taught me a bit about tennis, as he was a tennis instructor for some time after retirement in Miami (Coral Gables). My brother still has a well read copy of Under my Wings. Because of Basil, I became an avid aviation fan and will forever remember him fondly. I was quite pleased to see this web page and thought that I would say hello and thank you for it. I have run across your page on the web regarding this wonderful man, Basil Rowe. Here is a bit for you that may be of some interest for you. In the early 1950's, as an early teenager, I belonged to the Air Scout Squadron 2, which was sponsored by Pan American World Airways in Miami. All members of that unit were sons of PAA employees. Our Squadron Advisor at that time was another well known pilot for PAA, Capt. Alan Lobeck. When I attained the coveted and highest rank award in the Air Scouts, the Ace Award, Capt. Rowe was present at the awards ceremony to present that medal to me. Although all these many years since and the actual medal has long ago been lost in so many moves, I have not forgotten that moment when he pinned that medal on the chest of my uniform. I also have one of his books. An originally published in 1956 by The Bobbs-Merril Co. of N.Y. which is signed by Capt. Rowe with the notation made "To Bill Boger, my good friend and fellow PAA'er". Basil L. Rowe......The book too has suffered from some of those many moves mentioned before but is still in pretty fair condition in spite of that. It has been read many times and remains in my library shelves here at home. Editor's Note: My thanks to John for sharing this precious memory with me and our visitors. It is this kind of personal recollection that helps so very much to make the memory of this pioneer come alive again. It is located on the corner of Route 28 & Fox Hollow Road in Shandaken, NY. ONLINE RESOURCES If you search for "Basil Rowe +aviation", (11-3-05), you will find about 31 links. Each of the links leads to a little bit of information on his career and will help you to understand his story. Rowe, Basil Lee, Collection, Acc. XXXX-0019 On this page of the Smithsonian, National Air and Space Museum, Archives Division, website is found list of "Repositories Within the Smithsonian Institution." Included is a very nice biography of Basil, brief, but very comprehensive. You can access this site by clicking on the title above. "On the Bridge of a "Flying Clipper Ship"
UNIQUE AVIATION TREASURES This is an interesting website which offers many items of interest to the aviation fan. It includes a page on which you will find a photograph of Charles Lindbergh and Basil Rowe, along with a short biographical note. You can access the page by clicking directly on: Collector's Pieces I recommend that you take the time to enjoy the many other items on the site by clicking on the title above. Description: from the front flap of the book. 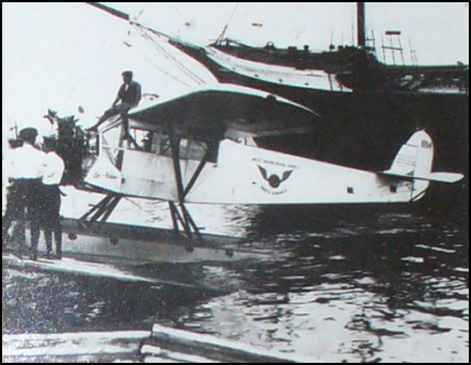 "Captain Basil Rowe has flown more miles than any other man who ever lived - a distance equivalent to more than 223 trips around the world. Under My Wings is his adventurous autobiography, the story of a great airlines pilot, of a man who started as a barnstorming kid just before World War I and has made flying a passport to five continents and an eventful life. Stunt flying, racing, early work with seaplanes, pioneering his own airline through the West Indies, mapping new air routes in South America, working through World War II and the Korean War as a MATS pilot--Captain Rowe has flown everything, has flown everywhere. 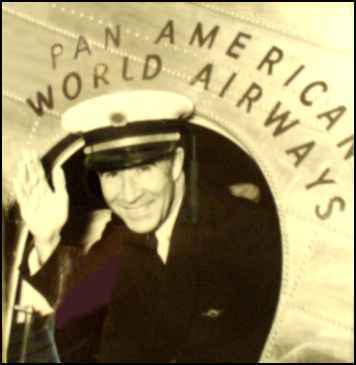 He ended his career as number-one captain for Pan American Airways. Never in those millions of air miles has he ever lost his love of the clean freedom of flying. His story gives you the feel of it, and for the first time gives the book reader a real picture of what the pilot of a big passenger airliner actually does--and a clear understanding of the kind of man who makes so fine a pilot." Editor's Note: You will find a few copies of this book are being offered for sale on the net from time to time. You can find them by entering "Under My Wings" +Rowe in a search engine such as Google. I also discovered that a library in my vicinity, Glendale, CA, has a copy for loan. I had the pleasure of reading Capt. 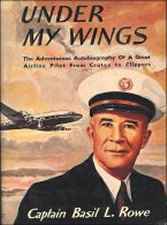 Rowe's book when I was about 12 years old--it was the very first book I read on commercial airline flying. I started flying with PAN AM in 1964-retiring in 1997. I was able to fly the B-727, B-707, L-1011 and the B-747. I wish I had had the opportunity to meet Capt Rowe. Basil Rowe died in 1974..